How many of you have had your phone charger cord (or any cord for that matter chewed on)? As in man’s best friend decides he likes the phone charger cord too! Well in my case it was the cat! I could see out of the corner of my eye my dog quietly snickering in the corner as I was chastising the cat! 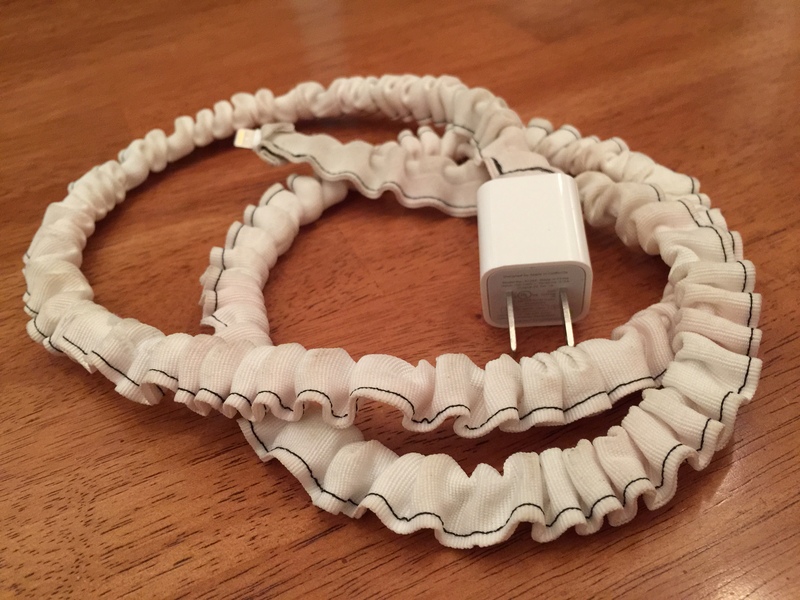 FYI, you can do this for any cord; even hanging lamp or chandelier cords you find unsightly! Try fabric that matches your walls to camouflage or bright fun fabrics for a pop of color! To make this I had a very long ribbon that was used to tie a comforter closed. Of course I saved it knowing it would come in handy. But, if you don’t have a ribbon just cut any fabric to size: About 2 inches wide by double the length of cord you are covering. Fold fabric in half and sew along edge. You can turn fabric inside out so the seam doesn’t show, however I left mine unturned as I liked the contrast in thread color. There really is no wrong way. Just get those cords covered!!!!! And you know what? It works! I haven’t lost a cord since this invention! I can’t guarantee the same results for you, but try it. What do you have to lose…well except for another cord! We’ve all had it happen to us…we lose the string around our shorts, skirt, or pants. It was there before we put it in the washer and now half is gone. How do we get it back out? It happened to my husbands shorts. I started re-stringing it this morning and my son was like, “that is so cool.” I said, “What’s cool?” He said, “I never knew that is how you do that.” He was impressed and I beamed my super hero mom smile at him. He told me I should blog about this. So here you go son, this one is for you. BTW, he took the pictures. What you need: One safety-pin however large or small to fit though existing hole. Tip: I use the longest safety-pin I can fit…goes faster. Pin safety-pin through on one end of string and begin pushing pin through. Keep on threading it through.. I have a dress that I can’t wear in public. It’s way too low cut and no undergarmet worked, so I wore it as an inside-the-house dress for a couple of years. Today I decided it needed a new life. And this is the life I gave it… A skirt with a pocket! I cut off the top part and used the two “triangles” as the new pocket! I sewed the triangles together to give me more fabric. Then I created the pocket you see. I wanted it to be just enough space for my iPhone and a lip gloss!